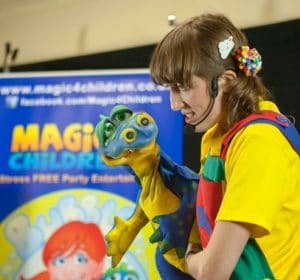 We’d love to introduce you to our newest children’s entertainer, Bubble! Bubble joined our team last year and has already become a firm favourite at many birthday parties in and around Cheshire, Manchester, Stockport and Chester. We thought it was about time we found out a bit more about Bubble, and of course her beloved sidekick, Squeak the Dragon! You’ve joined the Magic 4 Children team last year, what were you doing before? I have been an actor and workshop leader for over 10 years! I have done and still do lots of jobs from acting, to being a balloon artist, to teaching children drama. Every day is different–I love it! How long have you been a children’s party entertainer? I started training with Magic 4 Children last year. I had to go to magic school every week. It was just like being at Hogwarts (but without He Who Must Not Be Named)! What is your favourite thing about being a children’s party entertainer? 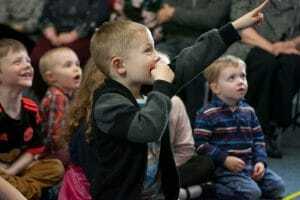 There are lots of things I love about being a party entertainer–making the children laugh, amazing them with magic and helping to make the birthday child feel super special! Tell us about “Squeak” your dragon. What is he like and what does he get up to at the parties? My pet dragon Squeak is my best friend! We go camping together, he toasts the marshmallows with his fiery breath, and we sing songs around the camp fire. Squeak loves singing and if you’re lucky, he’ll sing a special song for you at your birthday party! What is the funniest/most memorable thing that happened whilst you were entertaining at a party? One of my favourite parties had an Alice in Wonderland theme and we all had to disappear down a rabbit hole to get to the party food! It was so much fun! I love playing musical statues because dancing is one of my favourite things to do! I am brilliant at musical statues. I love challenging the children to see if they can beat me! I also love playing the bubble games because bubbles are AWESOME! Bubbles! Hehehe! Not really. I love tiny little sausages. I like to pretend that I am a giant when I eat them. Bubble (and Squeak!) have already had some great reviews from some happy clients. If Bubble sounds like the entertainer you would love to have at your next children’s party, then take a look at her party page and get in touch.